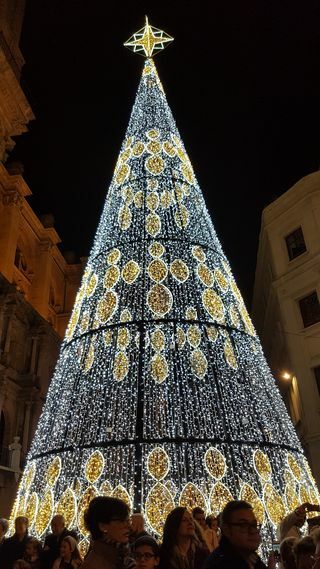 If you’re planning on visiting the Costa del Sol this Christmas, you’ve got to visit Málaga City Centre to see the stunning Christmas Light display and show in the city’s famous Calle Larios. Over the year’s Málaga’s Christmas lights have quickly become one of the most talked-about attractions. The Town Hall spend hundreds of thousands of Euros on Christmas lights – this year’s budget is a staggering €733,211 – and the results speak for themselves. Below you can see a video of last year’s electrifying show featuring hundreds of thousands of LED lights and hit songs to accompany the light show. Pretty impressive isn’t it? 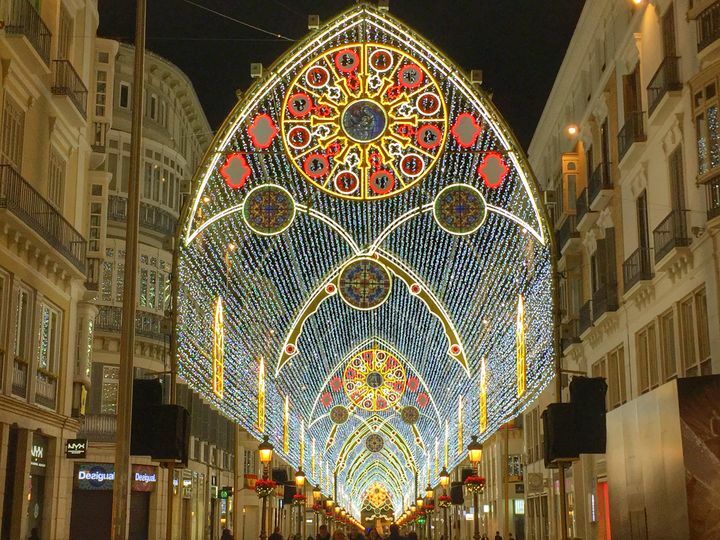 Plans for this year’s show in Calle Larios include a similar light show which will reproduce Málaga Cathedral’s spectacular stained-glass windows and domes, and making reference to the Nativity of Christ. After the success of Malaga’s light show in recent years – with hundreds of thousands of visitors – this year’s show will also feature a spectacular light and sound show. The technicians are hard at work putting the finishing touches to the display which will officially open to the public on Friday the 30th November with a party at 7:00pm. It’s going to be busy so we recommend you get there early if you want to get a good view! The organisers will also be handing out 10,000 glow sticks so that all who attend the opening party can interact with the music and light show. Each show lasts between 2 and 3 minutes and are sure to be the high point of your visit to Málaga City Centre over the Christmas period. On the 30th November (the day the lights get switched on for the first time) there will also be a special kids show in Plaza de las Flores at 6:00pm. During the afternoon, the organisers will be handing out 1000 balloons with Christmas designs to kids in the audience. In Plaza de la Constitución (at the end of Calle Larios) there will be a concert after the first light show (at around 7:00pm). This year, the city will feature a Christmas tree which you can walk through in Plaza de la Constitución as well as a tree in Plaza la Marina which will change colour and show Christmas motifs thanks to state of the art LED technology. Four new trees will also light up Plaza Eugenio Chicano and calle Santa María. As well as the new trees, this Christmas you’ll also see 140 bird motifs in Plaza de la Merced, four Christmas balls in Plaza de Torrijos and new Christmas lights designs in Calle Granada, Calle Molina Lario, Calle Cárcer, Casapalma, Soho, the Historic Town Centre, Marqués de Larios and the side of the main Alameda. If you’re planning on spending Christmas on the Costa del Sol and are looking for accommodation, at Sunset Beach Club we offer comfortable apartment-style accommodation and fantastic facilities for a fun Christmas Holiday. Our animation team will have a full activities programme for kids and adults and we’ll also offer a superb Christmas lunch and New Year’s Eve Gala Dinner. You can click HERE for more information. Hi Dave, I really don’t know… perhaps you could ask at the Estepona Town Hall or their Foreign Residents department.